A significant proportion of people are colour-blind (about 8 per cent of men and 0.5 per cent of women). Yet casinos (online and offline) routinely ignore the needs of those who cannot distinguish between certain colours. As a result, they unwittingly frustrate these customers and in many cases prevent them from gambling altogether. Fortunately, ensuring that casino games are “colour-blind friendly” is easier than one might think. In this article, we’ll show you how to avoid alienating this audience and losing potential revenue. Colour blindness is the reduced ability to distinguish between certain colours. It is usually inherited, but can also occur as a result of physical or chemical damage to the eye, nerve or brain. The most common form of colour blindness is red-green colour blindness (which includes the conditions protanopia, deuteranopia, protanomaly and deuteranomaly). Blue-yellow colour blindness (which includes the conditions tritanopia and tritanomaly) is another, less common, form of colour blindness. While a significant proportion of people are colour-blind, very few people cannot see any colour at all. Only a tiny percentage of people have monochromatic vision. The term “colour blindness” is therefore something of a misnomer. Instead of seeing the world in shades of grey, the majority of colour-blind people can perceive almost every colour in the spectrum (which is why they tend to get annoyed when those with normal colour vision ask them questions like “Can you see red?”) They just have trouble distinguishing between certain colours. Why do so many casinos fail to check whether their games are accessible to the colour-blind? In our experience, most fail to do so because they are unaware of the stats. That is, most simply do not realise that such a large proportion of the population is affected. Those that do realise that more than four per cent of the population is colour-blind, however, often do nothing about it, dismissing this figure as trivial. Although four per cent might sound small, for most casinos, it represents a huge number of potential customers and thus, a massive amount of potential revenue. But while some casinos continue to ignore this reality, this revenue is silently scooped-up by their competitors. Ironic, given the current economic climate, that some casinos feel that they can afford to ignore the needs of four per cent of their market. There is also a general misconception that making casino games “colour-blind friendly” costs a small fortune and takes a great deal of time to implement. This, however, simply isn’t the case. Creating games that are inaccessible to the colour-blind may also constitute discrimination. It certainly contravenes the Web Content Accessibility Guidelines published by the World Wide Web Consortium (W3C; http://www.w3.org/)—that is, the guidance that underpins the legislation on web accessibility in many countries. So, the harsh reality is, if you don’t make your content accessible to the colour-blind, you may risk a lawsuit. Playing chips that communicate their denomination via colour alone can lead colour-blind gamblers to bet more (or less) than they intend. (Note that while the chips used in most casinos also communicate this information via patterning on their sides/edges, only dealers and highly experienced gamblers are able to decipher these codes.) The solution to this problem is to employ chips that have their respective values printed on their surfaces. 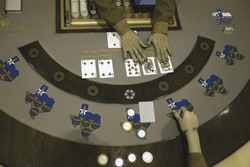 For card games like Poker and Bridge, casinos often employ a four-colour deck. In a typical four-colour deck, hearts are red and spades are black, as usual; but clubs are green and diamonds are blue. With regard to Poker, a four-colour deck allows players (with normal colour vision) to more easily recognise a hand in which all five cards are of the same suit (a flush). With regard to Bridge, a four-colour deck is perceived to reduce the risk of a player accidentally “revoking” (that is, illegally playing a card of a suit other than the one that led). Note that since the typical four-colour deck employs red and green, people with red-green colour blindness (that is, the most prevalent form of colour blindness) are denied these benefits (to some extent) and their non-colour-blind opponents are thus given something of an unfair advantage. Four-colour decks are particularly popular in online versions of the aforementioned games, where the cards are smaller than their physical equivalents and thus more difficult to identify from the symbols and text printed on them. This combined with the fact that decisions must usually be made more rapidly (due to shorter time limits on turn-taking and the fact that many online players play multiple tables simultaneously), creates even greater potential for misidentification of cards. With regard to dice games, poorly chosen foreground and background colour combinations can mean that colour-blind players are unable to perceive the numbers that they (and their competitors) roll—and, where multiple dice are in play, can end up rolling the wrong die by mistake. The solution: If the game involves a single die, casinos should use a black-and-white (or dark-red-and-white) colour scheme; while if the game involves multiple die that need to be distinguishable, they should use high contrast/low contrast colour combinations. Take a look at this YouTube clip: (http://www.youtube.com/watch?v=be8LlKcgo1w). In this example, the player cannot tell how much money he has won, as the amount depends on the colour of the sevens. Games that can be found in casino bars can also be problematic. Playing snooker can be difficult for the colour-blind, as snooker balls are distinguished by their colour alone. Playing pool, however, is not, as pool balls are (usually) distinguished by their colour and pattern (spots or stripes). Running photos or screenshots of your games through a colour blindness simulator—like Colsim (www.colsim.com), our own online colour blindness simulator—will tell you whether they are “colour-blind friendly” or not. Where they aren’t, you should be able to fix them quickly and easily using some of the simple solutions described above. A normal human retina contains two kinds of photoreceptive cells: rods (which are active in low light) and cones (which are active in daylight). In most retinas, there are three kinds of cones, each containing a different pigment, which are activated when the pigments absorb light. The spectral sensitivities of these cone types differ as follows: one is most sensitive to short wavelengths within the visible spectrum, one is most sensitive to medium wavelengths and the other is most sensitive to medium-to-long wavelengths, with their peak sensitivities being in the blue, green, and yellow-green regions of the spectrum, respectively. These cones are often called S cones, M cones, and L cones for short (reflecting their sensitivities to short, medium and long wavelengths). Colour blindness results when one or more of these three cone t ypes are defective or absent in the retina. Monochromacy, also known as “total colour blindness”, is a lack of ability to distinguish colours. It is caused by the absence or defectiveness of two or all three, of the different types of cones. Those with this condition see the world in shades of a single colour (red, green, blue or grey). It is extremely rare, however—affecting approximately 0.00001% of men and women. Dichromacy is a moderately severe form of colour vision deficiency, caused by the absence or non-functioning of one of the three types of cones. distinguish between these colours. They also find violet, lavender and purple to be indistinguishable from various shades of blue because their reddish components appear so dim. Dichromats with deuteranopia (approximately 1.5% of men and 0.01% of women) have absent or non-functioning M cones. As a result, they see oranges, yellows and greens as shifted towards red, making them hard to distinguish. Violet, lavender, purple and blue would also appear pretty similar too. Dichromats with tritanopia (approximately 0.008% of men and 0.008% of women) have absent or non-functioning S cones. As a result, they have difficulty distinguishing between greens, cyans and blues; and yellows and violets. They can also confuse pinks, oranges and browns. Anomalous trichromacy is a mild form of colour vision deficiency, occurring when one of the three types of cones is altered in its spectral sensitivity. Anomalous trichromats with protanomaly (approximately 1% of men and 0.01% of women) have defective L cones. They therefore experience similar, but less severe, problems to those with protanopia. Anomalous trichromats with deuteranomaly (the most common form of colour blindness, affecting approximately 5% of men and 0.4% of women) have defective M cones. They therefore experience similar, but less severe, problems to those with deuteranopia. Anomalous trichromats with tritanomaly (approximately 0.01% of men and women) have defective S cones. They therefore experience similar, but less severe problems, to those with tritanopia. Etre is a premium, research-led design firm that takes a unique, people-centred approach to helping its clients innovate and grow. It identifies new opportunities for serving people (customers, employees, shareholders and others) by uncovering their latent needs, behaviours and desires; generates, develops and tests ideas that seek to exploit these opportunities; and then implements those proven to deliver real business results. In doing so, Etre creates pioneering companies, brands, products, services, spaces and experiences. 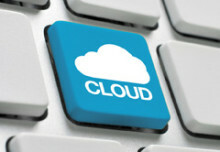 Its clients include American Express, John Lewis, Mars, Rolex, Vodafone, Nokia and Eurostar. Visit www.etre.com for more information.